This is a picture of my friends and I in our 2008 Tetris Halloween costumes. We took one-and-one-half foot by one-and-one-half foot boxes and wrapped them with different colors of wrapping paper like in the game Tetris. We tried to match the colors accordingly. Then we formed shapes with the many boxes to make Tetris pieces. We kept them together by using black or gray duct tape. We cut holes in the boxes so that we could stick our heads out. We also matched the color of our pants, socks, and shirts to go with the color of the Tetris piece. When we came together we formed seven pieces of the Tetris game and they all fit together like the game. It took us about three hours to make everything but it was so worth it to see our final creation. 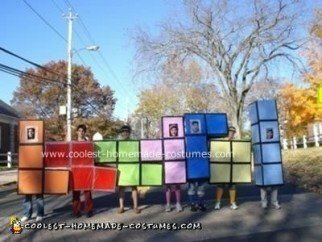 We came about this idea after playing a life-sized game of Tetris in Texas and thought that it would make a great Halloween costume. That is an amazing idea!!!! Great JOB! that is so wicked. You guys u did an AMAZING job that’s too awesome for words. wow that was so cool I got to know how to do that man. I’m gonna show my friends. 2 thumbs up. wow this is the COOLEST thing ever! To the people who made this costume…. how do you make it??? I am really interested in doing it for my Halloween costume. I was wondering where you bought your boxes and how you got them to stay on you. It is a very cool idea, except there are no hand holes! Also, where do you get enough cardboard to make them? This costume was the most creative I have seen! Tetris is my favorite game and you guys looked AMAZING! My friends and I are planning to do this as a class project this year. Is there a way you could possibly email this to us? These people are my heroes.